Theorem: Angle is a semi circle is a right angle. Given : Angle AOB is in semi circle. Theorem: Angles in the same segment of a circle are equal. Q 2: If diagonals AC and BD of a quadrilateral intersect at M. Prove that a line drawn through M to bisect any side of the quadrilateral is perpendicular to the opposite side. Q 3: Angles in a semicircle is always ____. 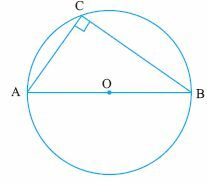 Q 4: Find the angle x.
Q 5: Two circles intersect each other at points A and B. If AP and BQ be the respective diameters, show that PBQ is a straight line.